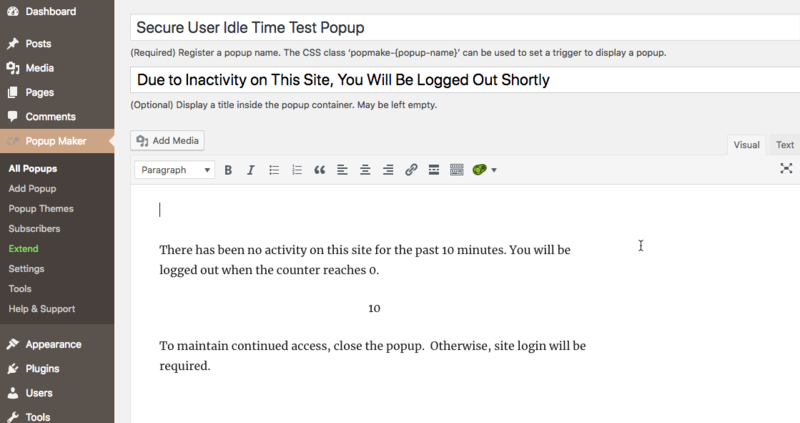 The Secure Idle User Logout (SUIL) extension to Popup Maker monitors continuous idle time on a web site. When a visitor is inactive for a period of time, a popup displays a countdown timer. When the timer reaches 0, the popup closes and the browser is refreshed. Visitors can disrupt the logout prompt by closing the SUIL popup before the countdown timer reaches 0. This resets the plugin trigger, which restarts the idle time countdown. The SUIL extension works well in combination with the AJAX Login Modals extension 'Force Login' trigger' (sold separately). The SUIL plugin provides an 'Idle Time' trigger to monitor site inactivity, and a 'Secure Logout Prompt' shortcode to set and display a countdown timer within a popup. When the SUIL popup closes, the AJAX Login Modals 'Force Login' trigger fires and displays a login form. Visitors are required to login again to regain site access. The SUIL extension is an excellent tool for managing access to sites (or site areas) that contain sensitive and confidential data. The SUIL extension provides access to an 'Idle Time' trigger in the Popup Settings box, and a 'Secure Logout Prompt' shortcode menu option ( tag: 'pum_secure_logout' ) in the Popup Editor. 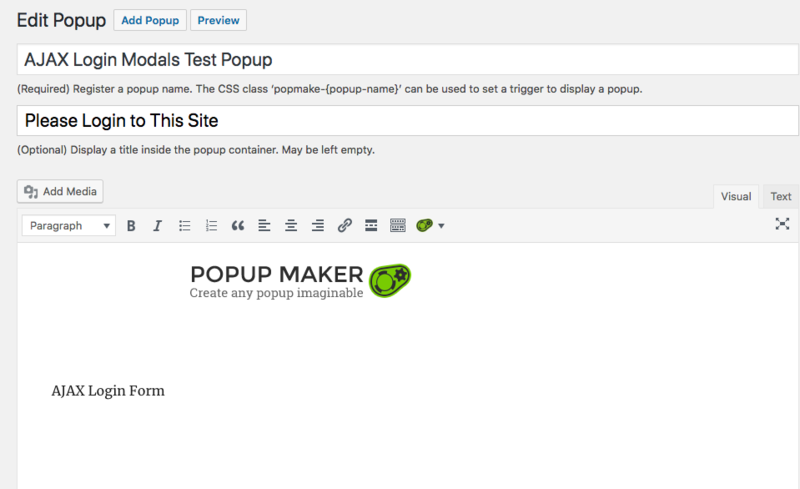 1) From the WordPress Admin, select either: 'Popup Maker' >> 'All Popups' to modify an existing popup, or 'Popup Maker' >> 'Add New' to create a new popup. 2) Within the Popup Editor, scroll to the Popup Settings box. 3) Select the 'Triggers' option tab, and the 'Triggers & Cookies' option category. 4) Click the button labeled 'Add New Trigger'. 5) From the trigger settings box, select the 'Idle Time' menu option, then select the 'Add' button. 6) Do not check the box labeled " Would you like to set up a cookie as well?". 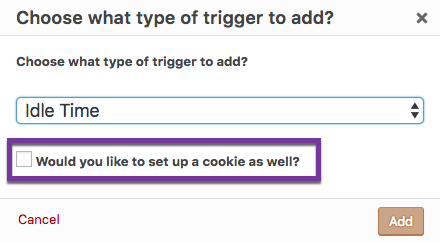 By not setting or linking a cookie to the trigger, the popup will continue to display each time the trigger conditions are met. See related article: 'Trigger' option settings // Refer to: 'Definition of Terms'. 2) click the + / - buttons. The timer buttons add or subtract time in one minute increments. All time values entered as decimals (for example, 3.5m for 3-1/2 minutes) will be rounded off to the nearest whole number. The initial range of accepted minimum and maximum values is 1 and 120 minutes respectively. Select the 'Add' button to save the idle time settings and set the trigger. 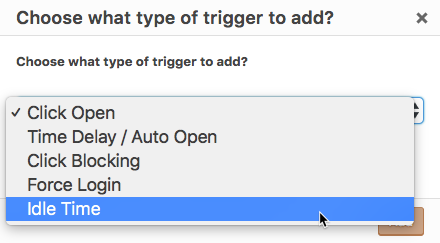 See related article: 'Triggers' option settings // Refer to: 'Edit an Existing Trigger' or 'Delete and Existing Trigger'. In the Popup Editor, (1) click the Popup Maker shortcode button, and (2) select the 'Secure Logout Prompt' menu option. Set a value for the countdown timer in seconds. Countdown Time ( time range slider ) -- Plugin default: 30 seconds (initial range: 0 - 180 seconds). The countdown time sets the initial value that the timer will count down to zero. Form Alignment ( options menu ) -- Plugin default: 'Center'. 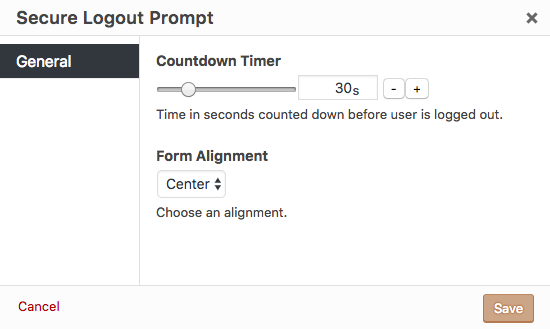 The form alignment setting positions the countdown timer within the popup editor. 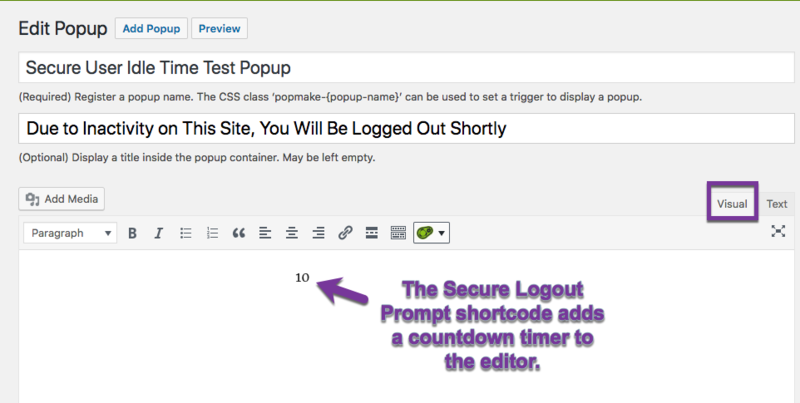 The Secure Logout Prompt shortcode option adds a countdown timer to the Popup Editor (Visual tab). By itself, the counter lacks any context when displayed to a site visitor. 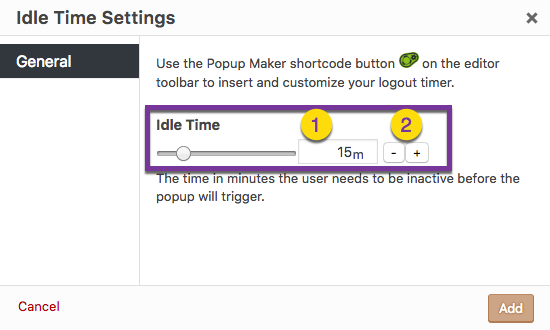 Plugin users can add content before and after the timer to give it context within the popup. The screenshot above displays the popup on the site's front end with the countdown timer at work. 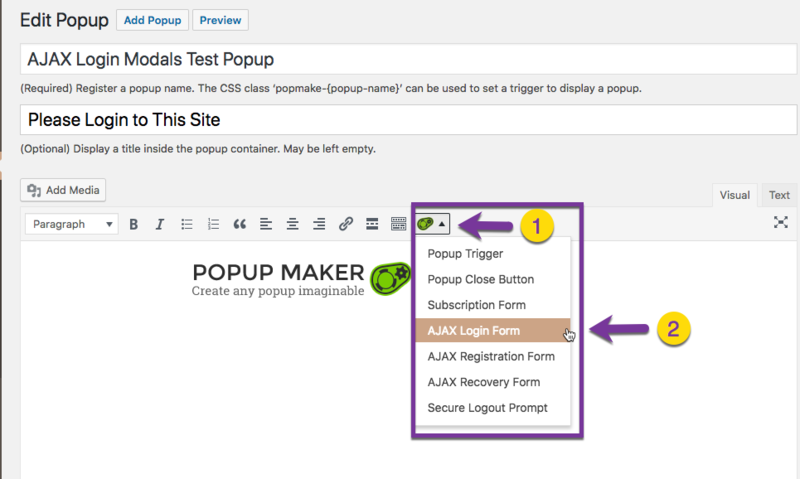 The Popup Maker SUIL and AJAX Login Modals extensions can be used together to securely logout an inactive user, and log them back into a site. The following 4 steps demonstrate how to use the 2 plugins together. Either add a new popup, or edit an existing one. In the Popup Settings box, select the 'Trigger' tab and 'Triggers & Cookies' category. Select the 'Add New Trigger' button (or edit an existing trigger) and set a new Idle Time trigger. Save or update the trigger. Do not set nor link a cookie to this trigger. Select the 'Targeting' tab in the Popup Settings box, and make sure that the targeting field remains blank (plugin default). The popup will activate on all posts and pages throughout the site. For additional information on how popup targeting works, see the related article below. In the popup editor, add any content before or after the countdown timer to provide context to the visitor. Select the 'Publish' or 'Update' button to save the changes. Create or edit a second popup. In the Popup Settings box (Triggers tab), set a Force Login trigger. On the 'Targeting' tab, leave the targeting field blank (same settings as in the previous step). 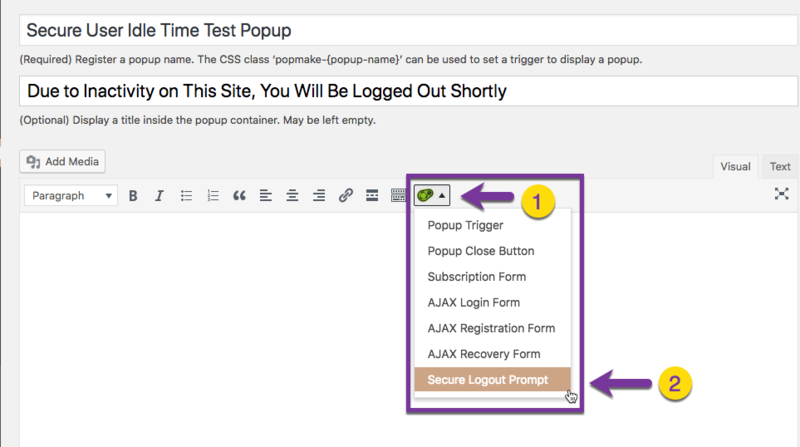 In the Popup Editor, (1) click on the Popup Maker shortcode button, and (2) select the AJAX Login Form menu option. The shortcode will generate a login form in the popup when it displays on the front-end. Visit the front of the site, and use the Popup Maker Admin Toolbar to trigger the display of the SUIL popup. Once the popup opens, the timer will count down. When the countdown reaches 0, the popup will close, and the AJAX Login Form popup will display. Visitors will be required to log back into the site to regain access.